Once again, I turn to my blog as a way of helping me to make sense of things, melanging images and words to ease my mind (and perhaps that of someone reading this from afar). It’s interesting how photos that I have made awhile ago sometimes become more poignant and appropriate months or even a year or so down the road. This one is a case in point. Yesterday was a monumental day for me. After months of knowing that my fibroid embolization had failed; after months of experiencing daily, sometimes crippling, pain; after a lifetime of experiencing hemorrhagic bleeding every single month; after more than twenty years of believing that I had endometriosis and finally having that diagnosis confirmed… yesterday, I took a deep breath and scheduled my hysterectomy to take place in April. I’m scared. It’s normal, this is a major surgery, and the endometriosis makes it even more complicated. My doctor is gentle and compassionate. He listens well, and he is the first doctor who suspected that I had endometriosis and validated how it and the fibroids have caused me a lot of pain and suffering over the years. He has a manner that is reassuring, and I trust him. I am confident that he will do everything in his power to make sure that the procedure goes well. It’s still scary, however. Things happen. Not everything is within his locus of control. My last experience with anesthesia wasn’t a good one, but he has assured me that I will be completely asleep this time and will not feel anything during the procedure. I will be blissfully unaware of what is happening and have no memory of it. I am holding onto that notion, clenching it tightly in both hands. The word “Hysterectomy” brings up stuff for a lot of women. Some women are scared of losing their femininity, seeing the womb as the ultimate symbol of their womanhood. One of the women who lives in our village, whom I encounter regularly on my afternoon walks, told me that her hysterectomy was 25 years ago and that it took her months to get over the loss of her uterus because for her, it had been the home of her babies. She grieved hard after her hysterectomy. Other women have told me that it was the best decision they have ever made, that it gave them back their bodily autonomy and their liberty. Others have said that they did it because they had no other choice, that what they were experiencing was just not sustainable. They were rather stoic about it. I am 49 years old. In my case, the baby-making factory shut its doors many years ago. My daughter is 26, and I knew after her birth that I had no intention of ever becoming pregnant again. I don’t grieve for symbolic loss of my femininity. It is not my uterus that makes me a woman, although there is a certain nostalgia that surrounds the notion of the womb. My children are the only ones with whom I have had such an intense bond that they actually breathed through my body. And given that he is no longer here, on this round, blue planet, I cherish that unique connection to my son. The scar on my abdomen that resulted from his birth remains a tangible testament to the fact that there was once a time when he was here, when I could physically feel his presence, when he was a part of me. The last time I touched him was almost 11 years ago, and my scar aches when I think about that last touch and how hard it struck me when I noticed at precisely that moment, that he had my hands. My uterus aches with joy when I think of the moment of my daughter’s birth, immediately after her first breath, when I had been completely unaware of whether she was a boy or a girl. The doctor teased me for a few seconds before finally relenting and telling me that she was a healthy, little girl. I forced myself to sit up and verify that indeed, she was a girl. Then I lay back on the bed and said breathlessly, “Thank god! That means that I never have to do this again!” I drifted off into a state of delirium and bliss, oxytocin coursing through my veins, as they handed her to me and she nursed for the first time. I had wanted a little girl so much, and she was, and still is, the most precious gift I have ever received. Yesterday my doctor told me that some women experience fantom pains after a hysterectomy, which is something I had never heard. Their nerves send signals to the brain as if the sick uterus is still there, behaving as it always did. I knew this was the case with amputated limbs, but not with the uterus. Not that I anticipate having that problem I just find it fascinating. As a trauma therapist, I was taught that the body catalogs and codes memories at the cellular level at the precise point of injury, that they are not just something that exists within the rolodex of certain regions of the brain. Our history is embedded into every muscle and nerve fiber of our being, into the atoms that make up our blood. We carry our past with us. Wherever we go, there it is. For some of us, to write is to breathe. It gives us the oxygen we need in order to survive. Words take flight, and our imagination flaps its wings along with them. Words take us into the darker places, the places we may fear to tread, but they stay there with us, steadfast, a beacon of light as we make our way through the darkness. Words take us inside, into the quiet spaces, the intimate spaces where we are able to breathe a little bit more deeply. The make us slow down and savor the poignancy of the moment. Words heal. Last week I sat down with an article by author/artist Jerry Saltz, Thirty-three rules for being an artist. My pen was poised above the notebook that organizes all of my random thoughts about life and art. A cup of my favorite tea, aptly called ”My Zen Moment,” was at my side. In the article, there is one exercise that asks the reader to recall a time when she cried while looking at a piece of art. That was not hard for me to come up with. 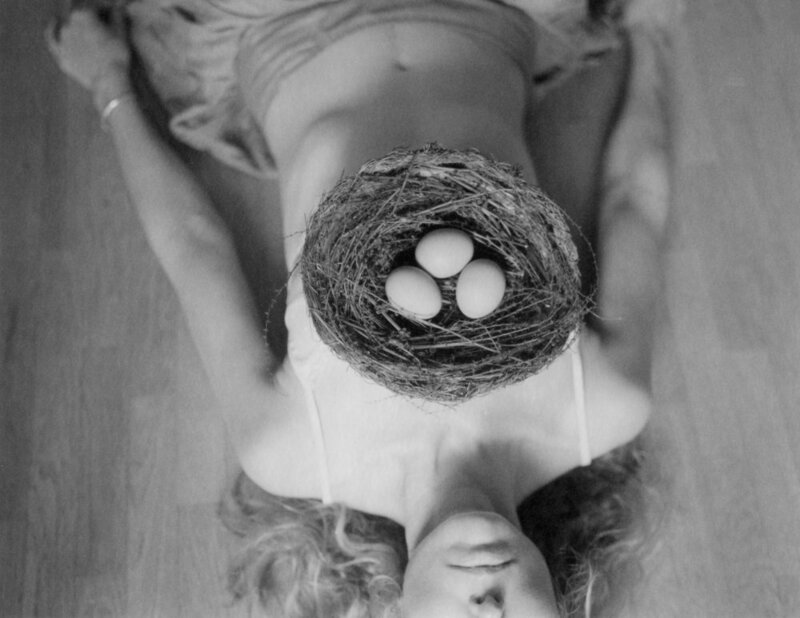 My mind quickly went to the times I have sobbed like a baby on seeing Lori Vrba’s photography. So, mentally immersing myself into Lori’s world, I proceeded to the next prompt from that exercise: Think of six words that describe the art and how you relate to it. Reducing a piece of art to six words is not a simple task. There is a swirl of emotions inside of us when we relate to art on a deep level. This often happens in a vacuum of wordlessness. Emotion comes first, words usually follow. And slowly, as I rested with the images at the forefront of my mind, the words started to emerge from the depths. First came Wonder and then Transcendance. These two are related , as wonder gives birth to transcendance. Then came Melancholy as it relates to the loss of something. In that space where melancholy or loss is expressed, that gives rise to hope and healing, a return to the idea of the transcendance that I feel upon seeing these images. Some images explore grief, but the leave the viewer feeling hopeless. Not Lori’s. I look for art that feels healing, that acknowledges the darkness, and yet does not let it overtake. This philosophy also guides my search for literature and my goals with my own writing. Hope is what allows us to keep going. The next word that came to me was Sensuousness. There is a tactile, textural quality to these images. I look at certain ones, and I can feel the warmth of the southern light or the wind on the coast or hear the rustle of leaves. Sensuousness means something that awakens the senses in a nonsexual way. This is something that I also seek out in writing. I want to be transported to another time and place. That’s also a form of transcendance, is it not? The next word that came to me was Eternity. This word speaks to me of something that has existed forever and will outlive me. It is a connection to something larger than and beyond myself. I liken it to the sacred. And lastly, there was Innocence. Wonder, Transcendence, Melancholy, Sensuousness, Eternity, and Innocence. These are the magic words, my magic words, the article says. They are the keys to making art that reflects who we are, art that is infused with our essence. Given the opportunity to select another word, I would add intimacy. It accurately describes Lori’s work, and is something I crave both in art and in my life. Though Lori was the first artist who came to mind as I worked through this exercise, she is not the only one whose work has the power to evoke such emotion in me. I have similar responses to the work of Tobia Makover and that of my dear friend, Dawn Surratt. I breathe in these words, and I let them move through me. I wrap them around me like a blanket as I move through my days. The one word that came as a somewhat of a surprise, somewhat but not completely if I am honest with myself, is innocence. I think of innocence as a state of purity, something unadulterated, unpolluted, unapologetic. This is a concept I have flirted with occasionally in my work, but haven’t dug into fully. It relates to past experiences I have been revisiting since my medical procedure opened up this Pandora’s box of emotions inside of me. One thing that I have alluded to but never publicly written about is the sexual abuse I experienced during my childhood. It is something I have spent more than twenty-five years healing from. The details of that experience are unimportant. As I said, I am not one who wants to linger in despair, preferring to swim through it and emerge on the other side of that river. Too many stories of abuse focus on the trauma itself, and while it is necessary to acknowledge the damage that was done, that is not my focus here. The healing process is rich and fertile, and while it is scary and difficult, that is where the magic happens. Healing is what fascinates me, how the layers of the trauma continue to unfold and be peeled away. Stories of healing give us hope, help us to transcend. When I worked as a therapist, I used to talk with my clients about how healing from trauma was like peeling away layers of an onion. Each time we are triggered and work on a different level of healing, we peel back another layer, and it makes us cry, salty, stinging tears. And as they fall, they wash some of pain away. That onion becomes smaller over time as we continue to do the work, but it remains an onion, no matter how many times we peel away the layers. We uncover things slowly, and we can be triggered many, many years later. Each time that happens, there is something more to learn about how we carry this trauma. We go deeper. And each time it happens, there is a sort of reclamation of the Self that occurs. This is where I am, in the process of reclaiming the Self I once was. A very dear friend recently said to me, as we were talking about my surgery and the hysterectomy she had many years ago, that it’s incredible the things that come up for us when there is some sort of medical intervention done to the uterus. Incredible, yes, but also incredibly normal. Any trauma survivor divides her life into a “before” and an “after.” The time before our life was turned upside down, the time of innocence, can be something that haunts us. People often say that they just want to go back to being who they were before it all happened. It’s impossible to go back. That would be like un-knowing what you already know. It can’t be done. Yet, we don’t have to lose ourselves in the process either. We can hold onto the things about who we were before and carry them with us into the after. When I look at Lori’s photos, I see both of these. I see images that remind me of who I was before, as well as who I was once things started to happen, things that would change me forever. I see that innocence, but I see it in the images that speak to me of both the before and the after. The reality is that I didn’t lose who I was before. I am still the same little girl, but she is wiser now to the ways of the world and in her knowledge of herself. This is something that I find to be encouraging, and I hope it brings a message of hope to all of you who read this. If we dig deeply enough, we will find those parts of ourselves that we thought we had lost. They can never be truly lost, perhaps misplaced, but never lost. They remain with us forever. I now see that my next task as an artist is to tap into the purity that is still there within me and allow it to guide me, manifesting itself in my work. In doing so, I will be honoring that little girl I once was and all of my former selves. And in doing this, in making art that honors the entirety of my experience on this planet, I will be going back to those six words, those six sacred words…. Holding them close to my chest and breathing them in and breathing out into the world, bringing them to life. Isn’t that what transcendance is all about? You can listen to Shawn Colvin’s version, my favorite one, of this song here. I have spent all of my adult life searching for the elusive, mythical concept of home. I am not talking about a house or an apartment or a place to lay my head at night, but a place that feels like my refuge from the world, a place that reflects who I am as a person, an an artist, as a sometimes weary soul wandering through this life. For years, I carried around this vision of my perfect home: a big, old red brick farmhouse with a front and back porch, tall windows, hardwood floors, original doors and woodwork, a second story, surrounded by trees, gardens and countryside. This was the ideal I that I was always seeking, something I still have yet to find. For most of my life, I thought I had made this place up, that it had been something that manifested as a result of having known and loved so many old houses. But in a recent conversation with my mom, she told me that when I was three years old, we lived in a house exactly like that. I have some vague memories of our former house, but I hadn’t remembered that it was brick. What I remember most is a big bedroom, a grand staircase, and spending time playing outside. The house we lived in was once a stagecoach house, built some time around 1800. There were four rooms downstairs, four upstairs, a central staircase that divided the house in halves. It was situated at the end of a long, tree-lined driveway, off the highway between two small Illinois farming towns. The house was surrounded by a garden with hydrangeas, phlox, columbines, and huge trees. Beyond the house was a barn and a pasture with a pond. After our conversation about this memory/dream of mine, something in me cracked wide open. I have felt homeless for many years. Not in the sense that I haven’t had a place to live, but in the sense of not having had a place of sanctuary to call my own since I was a little girl. This red brick farmhouse was the only house I can remember living in during my childhood that was unmarked by some sort of trauma. Houses in my adulthood were also marked by traumatic events, adversity, and/or losses. And so, I came to realize that in all these years of searching for a dream house, what I have actually been searching for is a place where I am utterly, perfectly safe. In an ideal world, there is no safer place than home. During the middle years of my childhood, my safe place was outside, in the garden, under the pine trees, in the blackberry thicket, among the hollyhocks, in the neighbor’s corn field. Nothing could hurt me there. In my mind, the idea of Home became associated with a garden. As a child, I was often usually alone, which suited my introverted nature just fine, playing house, decorating these spaces with treasures that I had found in the yard and those that I had borrowed from inside the house. In that respect, I haven’t changed at all. I still seek refuge in a garden, and that’s a particularly difficult struggle, considering that I live in an apartment and no longer have a garden to which I can escape. I do have a lovely little balcony that is filled with flowers in the summertime. That helps. It’s not the same, but it certainly helps. The flowers attract bees and butterflies. Chickadees come to visit. My cat, Peluche, enjoys this little bit of nature also, spending her days lounging in the shade, of the potted bamboo, surveying the courtyard below. I still have a strong need to decorate a space in a way that helps me feel connected to the things I love, to the natural world, to my past. While I am safe and secure in our little apartment across from the Seine, the search for Home continues. We know that our stay here is limited, and we are searching for the place where we would like to settle and continue to build our life together. The night before last, I had another profound dream, where I was doing a “controlled burn” inside of my house as a form of maintenance. Yes, inside my house. It was to be something like what the Forest Service does to maintain our national forests, clearing away debris and litter from the forest floor. An interesting note is that there are some species of trees and plants whose seeds need fire in order to crack open the seed coat and allow them to germinate. In my dream, in order to prepare for the fire, which would only touch things left laying on the floor. No furniture, no walls, windows, structural elements, nor the foundation would be harmed by the burn. I was sorting through my possessions, throwing out those that no longer served, putting treasures away for safekeeping. 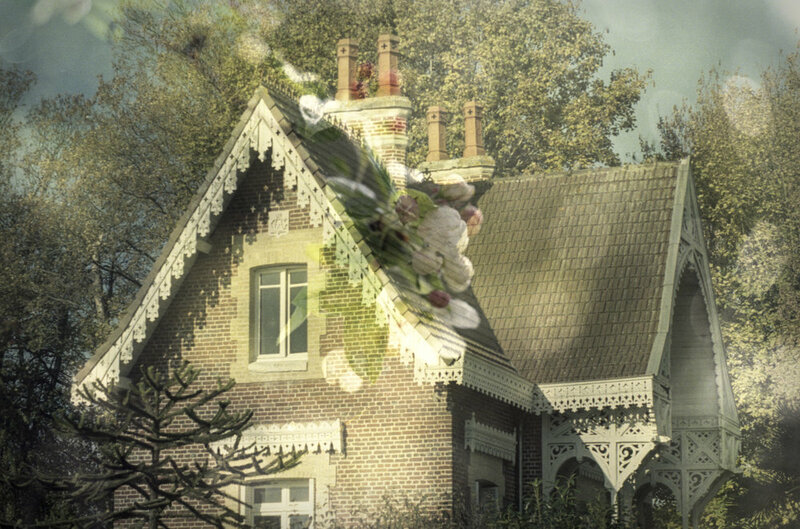 In dreams, a house represents the psyche, the core of our being. My subconscious is quite busy these days, in the process of discarding certain things which I no longer need and holding onto those that I do, even allowing seeds to germinate and grow. And after the blaze, out of the ashes, new, tender growth will appear. I will do whatever I can to nurture those seedlings, to water them carefully, to provide them light and air, and watch with awe as they take root and thrive. P.S. Shawn Colvin sings an unbelievable version of This Must Be the Place on her album Cover Girl. This morning I had a dream that was profound, really profound, and its residue is still seeping into my consciousness. In this dream, I was with someone I have known since I was a girl, someone who still holds a special place in my heart. We were driving a truck down the backroads, deep into the heart of the woods. The truck suddenly stopped moving forward. The engine was still running, but the only gear it would go into, was reverse. We decided that in order to go the way we wanted to go, we would need to turn the truck around and head down the road by driving in reverse. That’s exactly what we did. We ended up moving forward while looking backward. The more I mull this over, the more I turn it over in my mind, I see that that is one of the most profound lessons this life has to offer. In order to move forward, we need to see where we have been, who we have been, who we have been with on the journey. We take everything that we have been through, all our triumphs and losses, all our wounds and broken bones and scars, all our moments of shining in the spotlight, all our moments of grace…. We take all of the richness that this life has offered us, and we pack it up carefully into boxes and suitcases and hope chests. I hesitate to call it our baggage, preferring to think of it as our personal treasure chests. We take all this stuff, we load it into a vehicle that we steer through this life, and we set off down the road... There may be some things that we leave at the side of the road, as they no longer serve us. Others, we guard for life. Artists spend a lot of time sifting through those treasure chests, looking for raw materials that they can transform into something golden. Since my surgery last July, this is exactly what I have been doing. The trauma of that experience is something that scratched the scabs off old wounds, leading me to give attention and care to the places that were hurting once again. It’s not been an easy process. I have cried a lot in the past several months. I have been angry, probably for the first time in my life, at my biological father who essentially dumped me when I was 5 years old. That was the last time I ever saw him. Really, who does that to a kid? He started a new family with his new wife, and left my brother and I out in the cold, kicked to the curb like a pair of worn out shoes. Do you know what kind of message that sends to a child? It tells her that she is unworthy of love, not important, not good enough, unlovable even. Can you imagine telling that to a five year old ? Luckily, there was the constant, loving presence of my mom and my grandmother, and later, the man who would become my dad when he married my mom, to help counteract those messages. A little girl needs to have a man in her life who is a good role model, who is kind and loving and emotionally strong. She needs to know that there are good men in this world. A child needs to feel protected, to know that no matter what monsters lurk under the bed, the adults in her world will take care of everything. The world is a scary place. Adults are supposed to keep children safe from all of the dangers that lurk in and outside of the home. Children who are abandoned by one or both of their parents do not feel safe or completely loved. In their propensity for magical thinking, they internalize the message that there is something inherently wrong with them. If not, why else would a parent desert them? They become easy prey for those who would do them harm. Predators are many. I have known more than my share. In my looking back while moving forward, all of these thing are coming to the fore, driving me to go deeper when making art, to seek out my more authentic truths. It’s scary work. It leaves me feeling vulnerable and unsure how it will be treated by others. I don’t so much care whether they like it or not, but worry more about whether it will be seen through a lens of sensitivity and empathy. Any artist who bares her soul in the process of creating will know what I am talking about, how tender this work leaves us feeling, how exposed. So, the day after the Solstice, the day after my dad’s birthday, where we all feel the hope that comes with the renewed light, I leave you with this image, one from a series I am working on that is an hommage to the sacred feminine. When I look at this image, I see both strength and fragility here. And, yes, a certain vulnerability too. That’s perfect. It’s exactly where I find myself to be at this moment. Here’s to longer days and the return of the light. In two weeks I will be having a medical procedure to try to kill the seven fibroids that have taken up residence inside my uterus. The doctor said they have probably been with me for thirty years, and that even if they grow back after the embolization, they won't have enough time to become huge again because menopause is just around the corner. Well then... Madame Silver, vous n'êtes plus toute jeune. My fiftieth birthday is around the corner too. I will be turning 49 in November, and I feel the weight of this pressing down on me. Fifty feels monumental. There is no doubt that I have lived half of my life, that the rest is a downhill slide into ... into what? Oblivion? Not really. I don't even know what to call it. Into something other than what I have always known. Into the unknown. Ten years ago, when I was close to turning forty, I said that I didn't mind getting older because there is some freedom in that. We know ourselves better as we age, we are more confident, less bound by fears. These are wonderful things. I certainly don't want to go back to the way I was during my twenties. I was working so hard on healing the wounds of childhood trauma. These were tough years. My thirties were devoted to developing my skills as a therapist and to raising my children. My creative voice emerged during these years, and the fears started to part. Slowly, at first, but steadily, they left. I learned to speak, even as my voice trembled. I learned to share my thoughts and my opinions and the deeper parts of myself, with a few select people, with my writer's group. These were years of tremendous growth for me, and I am grateful to all the strong, intelligent women who helped me navigate these waters. We laughed together and cried together and held each other's hands. We ate buffalo wings together and drank margaritas and we analyzed each other's dreams. We shared our heartbreaks and our regrets and the missed opportunities that haunted us. Growth is not always easy. In fact, it's never easy. Love, tenderness, compassion, understanding, and an empathetic ear make the process feel safer. We emerge stronger and more sure of who we are. My forties were spent focusing on healing from the suicide of my son, on learning to live with that enormous hole in my heart. My autoimmune disease also unfolded during these years, which is really no surprise, given the immense traumas I have survived. My voice continued to become stronger through these years. My life changed drastically, and I now live in one of the most aesthetically beautiful countries in the world. I am facing fifty from a great vantage point, but it feels as is I am staring a wild beast in the eye. He is powerful. He poses so many questions and hurls things at me about how fast time is going, about how I am no longer young, about all the things that I have yet to lose before the end comes. I have never really been afraid of change. I have drastically, intentionally changed my life a couple of times, but those were changes over which I had some control. This process of growing older feels like one that will strip me of my power. It feels synonymous with loss. I am certainly no stranger to loss. That is a landscape I know so very well, a dark, familiar terrain. Aging forces us to come to grips with losses. The longer we live, the more people we lose; the more abilities we lose; the more independence we lose. I also already know what it is like to have things happen to and in the body. Fibroids are parasites. They feed on our blood and oxygen, and they grow. And grow. They can make us anemic and weak and tired all the time. They can make us bleed for weeks on end. They make us feel like our bodies are no longer our own. The same is true with an autoimmune disease. We do our best to manage the illness, but there are inevitable flare-ups, which knock us down. Hard. And so I am staring this beast in the eye, knowing that he is only going to get more powerful with each year that passes. I am left thinking about the most essential question anyone has ever posed: "What is it that you want to do with your one wild and precious life?" Thank you, Mary Oliver. My one wild and precious life... There are so many things. The list is long. The first thing that comes to mind is that I want to make art. I want to awaken in the morning just as the sun comes up, my head filled with visions and creative projects that are yearning to be made real. I want to tell stories with my camera, with my assemblages, with words. I want to work on projects to the point that my hands are achy and sore, fingers blistered, eyes foggy and tired, but a contented smile spreads across my face as I look back on the day's work. I want to let the luscious, juicy words spill across page after page in my favorite Georgia font, to let poetry drip from my lips and flow out from my fingertips. I want to see the world through a wide-open lens, where the focus is only on the most important things, and the rest of the scene is wonderfully blurred. I want to dance with wonder, letting him lead. Heart and eyes open, a willing partner, I will follow as he gently nudges me in one direction and then another. I want to swim at night in the dark, warm, silky waters. Naked. I want to feel the water gliding across my skin. Stars reflected on the surface of the water weave themselves into the strands of my hair. I want to feel open and connected to others, to animals and plants, to the rocks and the sea. I want to feel the seeds of eternity that rest in me, to know that they have sprouted and will continue to live long after I am gone. I want to make peace with my body and accept it as it changes. I will try to keep it as healthy and fit as possible, but I know that it will change. I want to see my body as something sacred, as a friend, a companion on this journey. I want to take care of it, so that it can continue to house in relative comfort and beauty for as long as is possible. I want to celebrate it, to revel in the pleasures that it gives me. Much of my early adult life was spent being disconnected from my body because it was the site of the traumas of my youth. It has taken many years, but I have reclaimed this sacred ground as my own. I want to continue to allow it to bring me pleasure, to appreciate all that my senses have to offer. Turning fifty will not prevent me from achieving any of these desires. Growing older will not strip me of my ability to seek these things out or to create them for myself. that is where I need to keep my focus. And so, as I prepare for this medical procedure, I need to remain focused on the fact that all the things I desire in this world are within my sphere of control. The rest is simply a distraction from what is essential to me. Wild and precious... yes, indeed. Sometimes, love is hard and scary. I'm not talking about romantic love, I'm talking about love in every sense of the word, every place in which we are called to be authentic with others and even with ourselves. We open ourselves up, we lay our emotions and our souls bare and hope and pray that our openness and vulnerability will be met with respect and tenderness. The world is not always so kind. Every extended hand demands that we take a leap of faith. Recently, I recalled something that struck me so hard when it happened, that nearly 20 years later, I am filled with tenderness when I think about it. One ordinary day, I was driving to the grocery store. It was spring. The earth was awakening from its winter slumber. I was noticing signs of new life all around me. Migratory birds were returning to the area, drawn by the numerous woods, ponds, lakes, habitats that our region provided to them. While driving down Emerald Lane, headed to the grocery store on that seemingly ordinary day, a small bird flew into the windshield of my car. The thump was so forceful, it startled me. I didn't see the bird coming, and I wasn't even sure exactly what I had hit. I stopped the car and approached slowly. There in the parkway, lay the trembling bird who had flown into my car. It was a little warbler, and it was hanging in the balance between life and death. I bent down and gently picked it up. It was too injured to try to move. It surrendered to the contact between us. The warbler lay in the palm of my left hand, trembling and gasping for breath. I could see its chest rising with each labored breath. I sat down in the grass and held this dying creature with all the tenderness I could summon. My heart was open and filled with the grace of the moment. I whispered a prayer of sorrow that his life was coming to an end and wished him a safe passage to the other side. A few seconds later, his tiny body stopped trembling. I cried. The great and final Stillness had descended upon him. He was quiet. No more labored breathing, no more uncontrollable shaking, no more fear. I sat motionless, aware of the breath going into my lungs, while his had stopped; aware of the beating of my heart, my on-going consciousness; aware that his spirit had flown away on the humid, spring breeze. I basked in the mystery of this fragile thing we call life, how there are so many tiny yet profound connections that happen along the journey, and how it can be extinguished so quickly. Mary Oliver says, "I'll take grace... You can have all the other words– chance, luck, coincidence, serendipity. I'll take grace. I don't know what it is exactly, but I'll take it." Connecting with this warbler, holding him as his heart stopped beating, trusting in the moment, being open to its ripeness and potency... That is what grace feels like to me. In making photos for my series "Where Love Resides," I am exploring everything that is connected to the notion of love. I cannot separate love from trust or faith or mystery or grace. Grace is like a love letter from the universe, one that is sprinkled with pixie dust and drifts down from the heart of the endless sky. Sometimes it comes like a feather floating on the breeze; other times it's a bird smacking into your windshield on a grey spring day. Happy accidents sometimes arrive when we open ourselves up to the process of experimentation and let go of control. Yesterday, I decided to try out a technique to reclaim the negatives of Fuji FP 100-C peel apart film. I had already intended to use the positives in another project, and wanted to see if the reclaimed negatives would be visually interesting of just a bit... blah. To be honest, the film itself doesn't really excite me all too much. I use it because it is reliable. After investing in packs of expired Polaroid film, only to find that the film is not usable, I wanted some certainty that at least a photo of some kind would come out of my camera, and so I asked for some Fuji film for my birthday. But last night, as I scanned the recovered negatives and saw the results on the computer screen, I almost fell out of my chair. The colors are unreal, the bleach cleaner having shifted them and destroyed to some extent the fragile emulsion. A lot of the detail that is visible in the original photos has been lost, but these scans have the ambiance of old pictorialist images. I could not be happier with the results. The rest of the series is visible on my gallery page. Light is an ode to life in general. It fills us with awe, with warmth, with hope. We gaze in wonder as the Perseid meteor showers traverse the skies in early August, their tails flowing behind them like glowing kite strings. We seek the golden warmth of the summer sun on the beaches, as the waves crash around us and the squeals of children’s delight fill our ears. The light soaks into our skin, and we wear the afterglow for weeks. After the deepest, darkest, most restless night, morning light comes as a balm of healing. It creeps through the cracks in the shutters, reaches under the curtains, tiptoes across the bedroom floor, and kisses us softly on our weary and half-open eyelids. Another day has come, and though we are heavy with fatigue, there is a certain grace in as we are enveloped in the softness of the morning light and we slowly emerge from the fog of a sleepless night. Light keeps us awake, gives us life. We need the darkness too, the shadows, for that is what frames the light, giving it shape, boundaries, texture. There is something sacred in the dance of these two partners. One leads, one follows. The roles reverse. They twirl and shift and in the end, each one takes a bow. Darkness speaks of quiet, coziness, a withdrawl from the world. When darkness falls, we go inside, to places where we are safe and protected. We slow down, we quiet ourselves. We do our little evening rituals, enjoying a meal, cleaning up, settling in under the covers to read before drifting off to sleep. Light may gives us life, but dark gives us much-needed rest. Either one, all the time would be torture. As in most things, balance is what we need. There are varying degrees of light and dark: neither is absolute. In our modern world where everything is lit up at night, there are few places on earth where light pollution does not exist. Cities emit a glow that reaches far into the surrounding countryside. The sad thing is that all of this diminishes the visibility of a natural source of night light, the stars. I once lived in the middle of a national forest, 25 miles away from the nearest small city. It was dark. Really dark. I loved the clarity and the brilliance of the stars, especially clear on cold winter nights. The darkest time of the year has its moments of brightness too. Though I appreciate the loud brilliance of the summer sun, I usually prefer the subdued, oyster light of winter. The kind produced on dreary, rainy days, that flows into my living room and spills gently across the floor. It was this light that inspired the first photo in my diptych above. The other photo is a double exposure that speaks of merging with the light, of becoming one with the shadows. It was also taken on a dreary day, just before the rain started falling. My wild nature seeks both the light and the shadow. She seeks to feel the warmth of light glowing inside and to give it an outward expression. She seeks to nurture the flame in others too. Light begets light. Making art gives others the permission and inspiration to do the same. The sacred connections between us are not just limited to something tangible. And so I put this out there, hoping that it may somehow inspire you to nurture your own light, while embracing the shadows that cradle it. 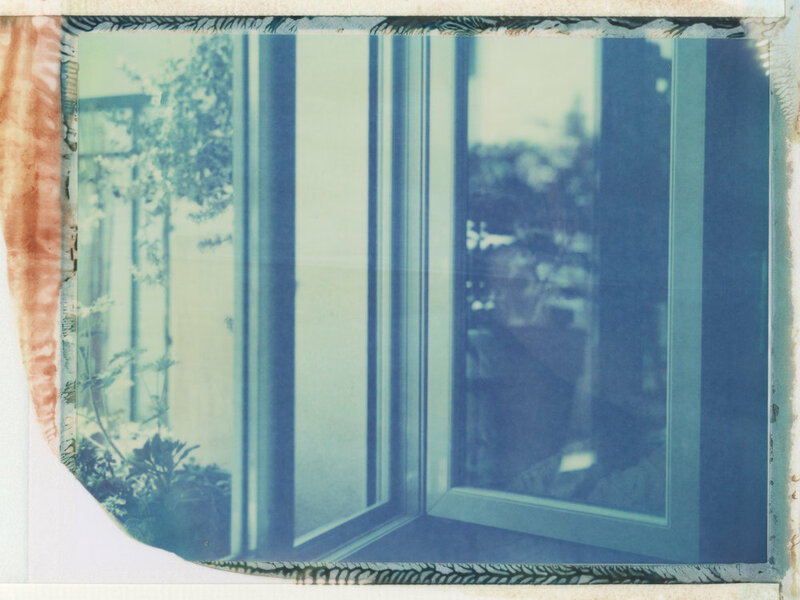 One of the best things about instant photography is the way the film lends itself to being manipulated by hand. These techniques can be challenging, but they also a great part of the charm of this type of photography. That is one of the things that allows us to make truly one-of-a-kind pieces of art. So, today, I will show you an example of "before" and "after." Let's start with after. I happen to find it more interesting, but you can judge for yourself. This photo collage was made by placing washed, positive, color transparencies over the top of black and white base photos, one that was just a photo of lace, the other, hand-written text. The pansies had been pressed, and when dried, attached to the photos to playfully echo the little pots of pansies in the foreground of each photo. I like the softness of the colors and the dreamy mood given by the transparencies. And while I love the golden tones of these photos, the others images send my imagination on a voyage in a way that is completely different. I like how the flowers and the body flow into one another, as if the legs had become the stem, or the flowers had become the torso and the face. It further reinforces the metaphor of femininity as a flower, playing on juxtapositions of strength and fragility, on the ephemeral nature of the life of all things. These photos are stripped down to their bare essence and rebuilt, thanks to the magic of scotch crystal tape. Reconstructing photos with transparencies, playing with different compositions, layering them over different photos, depending on how I am feeling that given day, all of this hands-on work is one of my favorite parts of instant photography. I love seeing the white stuff that separates the positive and negative halves of the photo come off with a wipe from the sponge. I like the smooth feel of the transparencies after they have dried. And I love the process of arranging and changing things around, of rebuilding photos again and again as new possibilities emerge. And in this case. the possibilities truly are endless.